The UC Santa Barbara Gauchos travel north to take on the CAL Bears in an early season MCLA lacrosse game. CAL jumps to an early lead in the first quarter before the Gauchos offense turns up the heat in the second quarter. CAL’s freshman middie from Novato High, Max McKone, scores an incredible five goals and pulls CAL to within 2 goals late in the fourth quarter, but the Gauchos win their sixth straight game of the 2014 season, 13-11. Short highlight video of the ASU vs. UCSB 2013 MCLA Lacrosse Championship Tournament game, played in Greenville, North Carolina! Colorado State capped an undefeated season, dominating UC Santa Barbara 14-4 at the El Pomar Sports Park to become the first No. 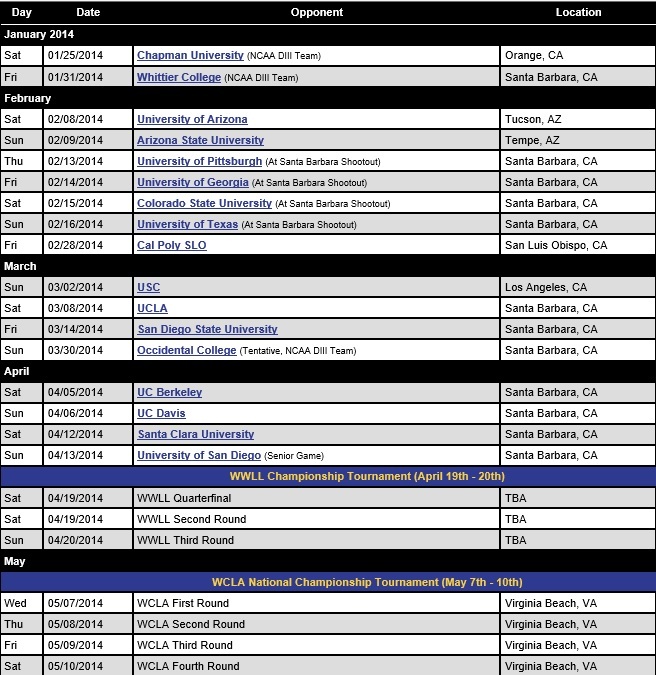 1 seed to win the US Lacrosse Women’s Collegiate Lacrosse Associates National Championship since Cal Poly in 2007. It was the third national championship for CSU’s seniors, and avenged a loss to UC Davis in last year’s title game. The Rams made history with excellent play and some serious toughness. She was hardly alone in showing grit. Senior midfielder Sarah Moyer got her left wrist stepped on in the semifinals and was gingerly holding it for much of the last two days. She scored two goals in the championship game. Senior Karly Slyne was wearing a knee brace from an injury she suffered on the same field last year, and ignited a key three-goal run in the first half with a goal and two assists. And senior attacker Maddie Garcia had her shoulder bandaged and was hobbling around on a bad ankle the entire tournament. She netted three goals in the championship game, and was named the tournament’s Most Outstanding Attack player. It was a fitting end to a record-setting day. With 14 seconds left in the game, UCSB’s Katie Mitchell buried a shot from close range after taking a pass from teammate Lindsay Alex to complete a 12-11 come-from-behind win over Brigham Young in the semifinal round of the US Lacrosse Women’s Collegiate Lacrosse Associates National Championships, presented by Harrow Sports. The victory sends the Gauchos to Saturday’s championship game against top-seeded and unbeaten Colorado State. The Rams exploded offensively, posting 23 goals in a 23-13 win over Cal Poly. The leader of the offense was senior Karly Slyne, who notched 12 points (7g, 5a), the second-best single game performance in the 13-year history of the tournament. It was sweet redemption for Slyne, who injured her knee last year on the same field and missed Colorado State’s championship game loss to UC Davis Club. Univ. of Texas 17, Pittsburgh 13: Texas junior Tully Moorehead led all players with eight goals in its win against Pittsburgh. All 17 Texas goals were unassisted, but came from eight Longhorn players. A tied game at 13 with 7:07 to play, Texas ended on a four-goal run to seal the win. Junior Stephanie Miller led Pitt players in points, notching four goals with one assist. Georgia 10, Santa Clara 4: Georgia held Maggie Burke, the WCLA Division I Midfielder of the Year, scoreless as Emily Seidel made nine saves to lead a strong defensive effort. Georgia held Santa Clara scoreless for more than 21 minutes in the second half. Georgia attacker Parisa Ayers led all scorers with three goals. Minnesota 15, Florida Club 14 (2 OT): Down 9-5 at half, Ashlee Miller scored Minnesota’s last two goals of regulation to tie the game at 13 and force overtime against the Gators. Both teams added a score in the first three-minute halves of overtime, tying the game at 14, but Miller would have a hand in the winning tally after finding Lisa Hirsch for the game-winning goal of the contest with 19 seconds left in sudden victory overtime. Miller (6g) and McKinley Cardin (3g, 3a) of Florida had six points each. Florida goalie Heather Gable finished with 11 saves and Minnesota goalie Alexandra Thalhuber finished with 13. USC Club 19, Maryland Club 6: After receiving five yellow cards in the first half, Maryland played two players down beginning with 2:02 left in the first half. Junior Erin McGillivary (6g, 1a) and freshman Elena Skouras (5g, 2a) led USC and all scorers with seven points each. USC graduate student Madison Aguirre made several point-blank saves for the Trojans ending the game with 10 total. Megan Lusby led Maryland with three goals and an assist. Michigan Club 16, Northeastern 9: Northeastern scored first, but did not lead the rest of the game and Michigan pulled away scoring the last three goals of the first half and maintained at least a four-goal lead to the end of regulation. Junior Julianne Patterson and sophomore Katie Mezwa led Michigan’s attack with five points each. Brittany O’Rourke had three goals for Northeastern. Virginia Club 19, Oregon Club 9: The Cavaliers opened the game with three-straight goals by three different scorers before Oregon got on the board eight minutes into the game. Virginia ended with nine scorers and 10 players with points. Grace Jackson (UVA) led all players with four goals and two assists. Keaton Otake (2g) and Hanna Peper (1g, 1a) led Oregon in points. Virginia goalies, Dana Sparks and Louisa Boyd, combined for 12 saves in the victory. 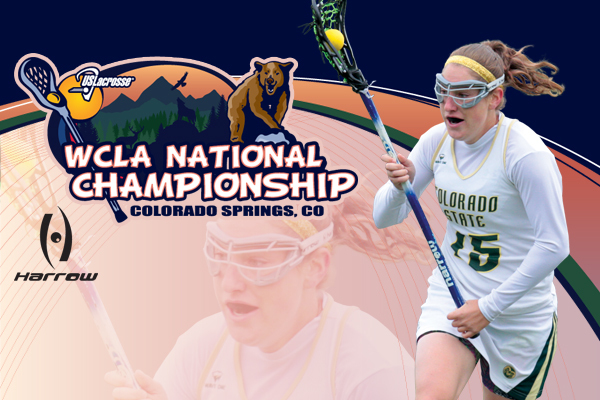 For the first seven years of the US Lacrosse Women’s Collegiate Lacrosse Associates National Championships, the event was dominated by Cal Poly with the Mustangs winning all seven national championships from 2001 to 2007. More recently, the dominance has shifted to Colorado State, with the Rams winning national titles in 2008, 2010 and 2011. 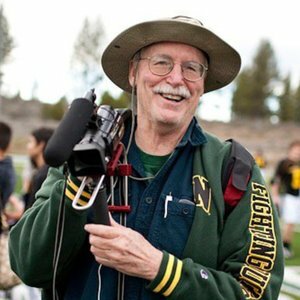 Those two heavyweights will square off in a semifinal of this year’s championship, presented by Harrow Sports, on Friday at the El Pomar Sports Park. Cal Poly defeated Texas 11-7 in the quarterfinals on Thursday, and No. 1 seed Colorado State topped Pitt 16-11. The other semifinal features underdog UC Santa Barbara, the No. 11 seed of the tournament, which pulled off its second straight upset by beating Georgia 11-6. UCSB will meet No. 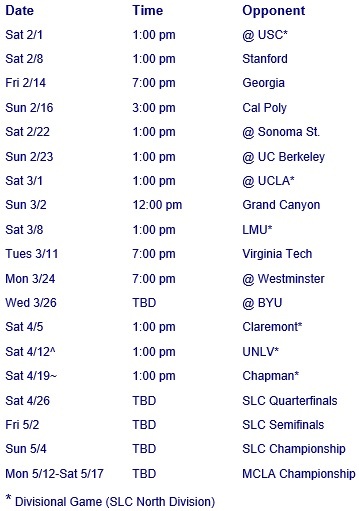 2 seed BYU, which easily handled Santa Clara 18-6. Colorado State 16, Pitt 11: Top-seeded Colorado State scored the last six goals of the first half, all in the final 10 minutes, to turn a 4-2 deficit into an 8-4 halftime lead and went on to earn the victory. Karly Slyne had three assists during the run and finished with a game-high seven points (3g, 4a) to lead the Rams. Sarah Moyer added three goals for CSU and Pitt was led by Christa Lausten and Kellyn Warren with three goals each. BYU 18, Santa Clara 6: BYU held Santa Clara scoreless for a stretch of more than 25 minutes from the end of the first half to late in the second half to advance to the semifinals. Megan McCleary made seven saves in the victory and Kristin Lund had a big offensive day with five goals and four assists. Briana Arnold and Brooke Smith also added four goals for the Cougars. Maggie Burke led Santa Clara with two goals and an assist. Cal Poly 11, Texas 7: Kelly Harris played her second straight big game, making 10 saves to lead Cal Poly into the semifinals. Emily DeSimone scored the first of her three goals with just 1:01 left in the first half to give Cal Poly a 6-4 edge at the break and then added two more goals and two assists in the second half to lead the Mustangs. DeSimone finished with three goals and four assists and Meggan Weinell had four goals. Tully Moorhead scored three goals for Texas and Ina Prevalsky added two. UCSB 11, Georgia 6: UCSB held Georgia scoreless for the final 24 minutes of the game to advance to the semifinals. Megan Hughes had nine saves for the Gauchos, including six in the second half. Katie Mitchell had a game-high four goals for UCSB, including the first three goals of the second half for her team. Lindsay Alex added two goals and three assists for UCSB. Jenna Dreyer led Georgia with a pair of goals. Minnesota 14, Virginia Club 10: Minnesota used a seven-goal run in the first half to overcome an early 2-0 deficit on its way to the win over Virginia. Barbara Mathewson had two goals during the run and finished with six for the game. Ashlee Miller and Sophia Nesser each added two for Minnesota. Grace Jackson had three goals and two assists to lead Virginia. Florida Club 18, Oregon Club 2: The Gators jumped out to a 12-0 halftime lead to cruise to a victory. Katherine Sonier led the Gators with five goals and Nicole White added three. Florida goalie Heather Gable made six saves. Kylie Agon and Nicole Hamburger scored for Oregon. Southern Cal Club 21, Northeastern 20: Megan Rilkoff scored her seventh goal of the game on a free position shot with 23 seconds left to break a 20-20 tie and give USC the shootout win. Halley Fisher had five goals and four assists for Northeastern, and had given the Huskies a 19-17 lead with 11:08 to play, but USC responded with a pair of goals by Elena Skouras to tie the game 19-19. The teams then traded goals before Rilkoff’s game-winner. Skouras added five goals for USC and Hayden Furey had four goals and two assists. Chelsea Andre (4g, 3a) and Anne Lally (4g, 2a) both had big games for Northeastern. Maryland Club 13, Michigan Club 7: Lauren Groft had five goals, four of them in the first half, to lead the Terps to a win. Groft added three assists for an eight-point game. Her fourth goal of the game came with 26 seconds left in the first half to help Maryland to a 6-4 lead and then the Terps scored the first three goals of the second half. Ashlee Wilkes added four goals for Maryland. Julianne Patterson led Michigan with three goals.